With the release of ‘Killer’ in 1971, Alice Cooper – the band, as they were then and not just the man – had perfected a blend of hard rock, art rock and glam. Tracks like ‘Under My Wheels’ had – and continue to have – a destructive brilliance, while even the more throwaway material like ‘You Drive Me Nervous’ provided a great, rough hewn alternative to the closest British equivalent in the Sweet. Somewhere between, the dark artistry of ‘Halo of Flies’ and ‘Dead Babies’ transpired the horror schlock of the band’s notorious live show into the kind of audio nightmares that irked America’s moral guardians. Perfection doesn’t come over night of course, and it had taken the band three albums to really hit their stride. Their 1969 debut ‘Pretties For You’ – aside from one obvious exception – bears absolutely no resemblance to their not too distant hit making future. The Alice Cooper of the late 60s were a chaotic art band and most of the music that filled their debut (released on Frank Zappa’s Straight Records in the summer of that year) is certainly closer to Mothers of Invention than the glam/proto-metal that would gain them worldwide acclaim. 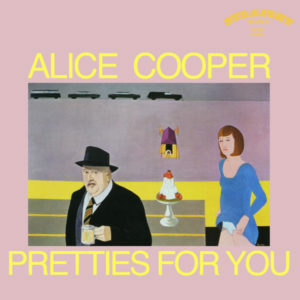 At its most difficult, ‘Pretties For You’ makes no attempt to create melody or make it an easy ride for the prospective Alice fan. The droning mellotrons of the appropriately named ‘Titanic Overture’ hint at wobbly psych and progressive rock, while simultaneously teasing with a carnival melody, before a grandiose piano melody appears, sets up an idea and then fades out rather provocatively, before ’10 Minutes Before The Worm’ steers the band towards more twisted glee with a selection of Zappa-esque percussion noise, completely unconnected to the quasi-garage rock tune that then springs seemingly out of nowhere. The band had the talent to turn in something akin to The Stooges, but instead apply crashing guitar chords to off-key harmony vocals delivering something that sounds like a bad overture to a cult musical. Vague hints of the Alice Cooper output circa 1972 are there, but they’re no more than fleeting. Even then, the connection is only really due to Alice’s familiar voice. Assuming you haven’t already turned off the album in disgust within those first three minutes, ‘Sing Low, Sweet Cheerio’ provides something closer to musical respite, but takes yet another detour when lead vocals are handed over to rhythm guitarist Michael Bruce. Presumably to wrong-foot the listener even further following two tracks that sounded unfinished, ‘Cheerio’ stretches to almost six minutes, taking in various moods and influences as it goes. To start, a rigid acoustic guitar sets in place a great musical motif. Beneath the hard chords, the rest of the band spring into life. Behind Bruce’s appealing lead vocal, Glen Buxton’s lead guitars add some fierce garage rock chops, chugging and clanging in the manner of the most discordant San Francisco freak-outs. The vocals soon grow into something even better when Bruce and Cooper harmonise – albeit in a very off-key way – but it’s the expansive instrumental work that makes the track stand. Across three minutes, drummer Neal Smith powers a rough sounding drum kit while the rest of the band drop into a fine, blues edged jam, never a million miles away from Jefferson Airplane or the Grateful Dead wig-outs of the era. A prominent harmonica played by Cooper helps draw further comparisons to the Dead’s early years with Pigpen, while a couple of blues guitar leads from Buxton often suggest there’s a great band trying to burst through the noise. With the album now having a feeling of direction, it turns heel again when ‘Today Mueller’ presents two minutes worth of theatrical nonsense. Much like ‘Worm’, the vocals are rooted within a music-hall influence, but as before, Alice is only too keen to rip the guts from the melody, turning everything into a Mothers of Invention worthy head trip. For those who enjoyed ‘Sing Low…’, ‘Living’ cranks the amps once more and gives the album a standout number when Alice and company do their damnedest to equal The Sonics and Monks in terms of lo-fi, straight up garage rock. Even if he doesn’t quite sound like the typical guitar hero of the era, Buxton’s guitar work is furious throughout, and while the aggressive end mix of the recording relegates the vocals to an echoing mess somewhere in the rear, that only adds to the overall excitement. This is one of those numbers that makes ‘Pretties’ more deserving of an audience, even if the more typical Alice Cooper sound is nowhere to be heard. Likewise, ‘Fields of Regret’ does a fine job in exploring lo-fi blues and garage rock tendencies, this time showcasing talents much closer to The Doors in the main, particularly through its love of rigid rhythms and a spoken word passage. There’s something far more menacing here than even the Lizard King himself could have envisaged (and he supposedly could “do anything”), since Alice’s voice is all but inaudible as he recites…who knows what…against scratchy guitar noise and some fine bass work. Moving back into the main melody of the track, this dark garage rock sounds even better than before, and whilst it could inspire moving on to the album’s second side now your ears are truly attuned to the chaos, unless you’re feeling especially brave, it’s more likely you’ll actually want to go and listen to The Stooges and The Sonics…which in itself is not a bad thing. ‘No Longer Umpire’ begins the second half of the album in a typically disarming way, when obvious melodies are eschewed for a crashing drum part punctuated with wordless yelps during the intro, before dropping into something approximating a carnival waltz re-imagined by a psych-rock band who are still a little green around the gills. There are glimmers of brilliance, though, especially within Dennis Dunaway’s ascending lead bass runs and valiant attempts at vocal harmonies in places where you mighn’t expect. ‘Levity Ball’ should be another highlight, but the live recording sourced for inclusion on the album is so raw that most of the potential coolness gets lost under a veil of mud. What’s immediately obvious, however, is a huge sixties melody; possibly inspired by the early works Pink Floyd, it seems half a world away from some of ‘Pretties’ more heavy-handed moments. If the Floyd aspirations aren’t immediately clear, by the time the instrumental section introduces various shrieks lifted straight from ‘Astronomy Domine’, it’s hugely obvious. With the track closing with more sixties vibes and something that sounds like The Hollies wandered into a Pretty Things rehearsal, you’ll so wish this could’ve been heard with much more clarity. A touch more Floyd inspires the short but weird ‘BB On Mars’, when a vocal inflection becomes a dead ringer for ‘Take Up Thy Stethoscope And Walk’, before a crashy tune touches upon The Mothers and Jefferson Airplane for further influence. As with ‘Umpire’, Dunaway’s work is stellar; here, he can be heard sliding his fingers up and down the bass frets maniacally while absolutely wringing the merry hell from his four strings. During these formative years, the angry way in which he plays more than suggests he’s the band’s most valuable asset. More sixties rock, this time with a particularly British slant not so far from The Who, ‘Reflected’ gives the album a genuine classic when a singalong hook comes out of nowhere to balance out some raucous garage rock. ‘Reflected’ was chosen as the band’s first single but, unsurprisingly, scored no success, but that shouldn’t stop even the most casual Alice fan recognising the main melody, since the chorus tune was lifted lock stock and the lyric rewritten as ‘Elected’ [a 1973 top ten hit in various European territories and top 40 US hit; a bona fide rock classic]. This early draft finds the familiar elements floundering amongst grumbling basses and a crashy wall of sound. Topped by a piercing riff from Buxton, this number is immediately very enjoyable, but becomes even more so when Buxton contributes a short but spirited burst of wah-wahed lead along the way. With Alice’s best vocal on the album and more than a hint of greatness, it’s impossible not to love this track, even if it is always obvious it deserved a much better send off. Notable for a layered vocal and a brilliantly jazzy drum part from Smith, ‘Apple Bush’ puts Cooper’s own spin on more San Fran rock. Right from the very start, this is one of the album’s highlights since the whole band appear to be reading from the same page, rather than hoping something tangible might come from a jam. Echoing the drums, Buxton and Bruce drop in some slightly ragged jazz rock guitar while Alice pulls the best from an unexpectedly strong hook. More pop than deep psych, this shows glimmers of things to come on ‘Easy Action’, a similarly unpopular follow up album issued by Alice Cooper just nine months later. Simply put, ‘Apple Bush’ is brilliant – it could’ve easily fit on Zappa’s ‘Absolutely Free’ or Airplane’s ‘After Bathing At Baxters’. Although it could be argued that ‘Pretties For You’ would have turned out better if a couple more numbers of this calibre were present, that would only weaken ‘Apple Bush’s immediate coolness as one of the era’s most tragically ignored, should-be-considered-classic tracks. After a couple of fantastic tunes – actual tunes – ‘Earwigs To Eternity’ threatens to set everything off course again with an odd sense of melody and rhythm. With the band taking what could’ve been a Beatle-esque harmony but then choosing to present it with various falsetto elements and a descending scale, it’s one of those tracks that rarely feels like any more than a distraction even with a few great flourishes from the rhythm section, before ‘Changing Arranging’ closes the album with another decent psych workout. Almost as if a light bulb of inspiration has been switched on at the eleventh hour, it does a much neater job than most of the other similar tunes. Taking cues – deliberately or otherwise – from Jefferson Airplane, MC5 and The Pretty Things, Glenn and Neal lead the charge into a depressingly short garage rocker that showcases more Floyd-ish “oohs”, but more importantly puts a genuine focus on songcraft. With some great harmonies and a classic sound, Alice sounds more inspired vocally, while Dunaway and Smith fill plenty of musical space. The chorus isn’t immediately obvious, but a few plays unveils the kind of sixties stance that can be found on various recordings collected on the Nuggets and Pebbles box sets celebrating so much similar garage rock of yore. Unsurprisingly, this never gets included on any of them… To call these three minutes “psych rock perfection” in the wider scheme of things would certainly be a stretch, but ‘Changing Arranging’ is easily one of Alice Cooper’s top five pre-70s recordings…and it’s the perfect way to end these thirty eight minutes’ worth of almost pure experimentation. In many respects, ‘Pretties For You’ is an album that could have only been borne of the late 60s. Even if Alice Cooper had entered the recording studio for the first time in the spring of 1970, most of this material would have been left behind to become a memory of live shows. However, it’s a much more fun album than the world has ever been led to believe. As far as debut albums go, its historical importance will always outweigh its brilliance, but for those deep into avant-garde rock, it’s an interesting audio document. It’s far from perfect, but should be required listening for those unenlightened souls who’ve always believed that Alice started with ‘Schools Out’ and only ever appealed to the classic rock audience. This entry was posted in Album & EP Reviews and tagged 60s, alice cooper, dennis dunaway, garage rock, glenn buxton, psych, rock by Real Gone. Bookmark the permalink.